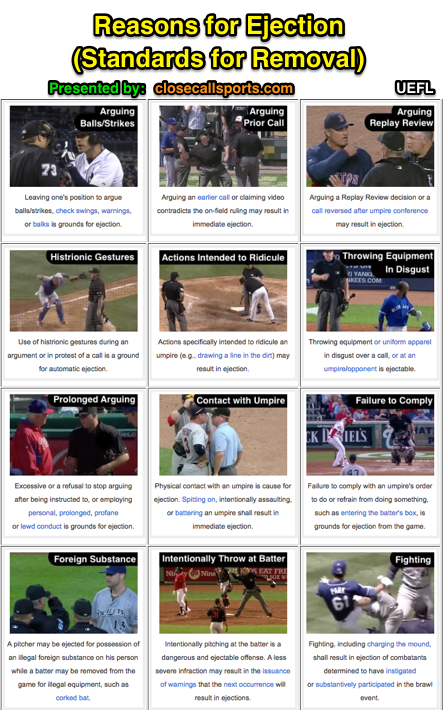 While searching for the baseball umpiring ejection classic, "Standards for Removal from the Game," I came to the stark realization that we have never really defined what an ejection actually is, or what conduct might necessitate one. Why do players and coaches get ejected, anyway? It is high time to correct this error and stop taking ejections and the associated decision-making process for granted. Let's begin with Official Baseball Rule 8.01(d) [known, prior to 2015, as Rule 9.01(d)]. Each umpire has authority to disqualify any player, coach, manager or substitute for objecting to decisions or for unsportsmanlike conduct or language, and to eject such disqualified person from the playing field. If an umpire disqualifies a player while a play is in progress, the disqualification shall not take effect until no further action is possible in that play. I'm sure lawyer-ball from the players' union has made the distinction between disqualification and ejection when appealing a supplemental fine or suspension levied for a player's failure to leave the field in a timely manner after being "ejected," but we're succinctly looking at an ejection as a disciplinary measure levied against uniformed personnel who commit an unsporting act. Philosophically, an objection to an umpire's decision via argument is generally an attempt to influence the umpire's call—if not the present one, then definitely a future one. This is an attempt to skew the rules to favor one's team: to tip the 50-50 balance to one's advantage. In other words, the umpire is the representative of his/her assigning agency (such as MLB) and "shall be responsible for the conduct of the game in accordance with these official rules and for maintaining discipline and order on the playing field during the game" (Rule 8.01(a)). Attempting to influence the umpire to tip the scales from 50-50 to so much as 51-49 is tantamount to rewriting the League's rulebook (or interpretation thereof) in order to favor one's team over one's opponent. It effectively is an attempt to win a game outside of prescribed boundaries by changing the rules during the game. Such an attempt at fraudulent lobbying (colloquially, "cheating") is rightly subject to disciplinary action, such as ejection. At the college level, ejected players "must be removed from sight and sound of the contest" (3-6d AR 2). Essentially, the player must leave the visual and auditory confines of the field and grandstands. The NCAA ejection restriction ends only after the umpiring crew has made it safely back to its dressing area after the game. Penalty is an automatic three-game suspension (formerly one game). At the high school level, it is important to note that while players may be ejected, they should remain "in the dugout or elsewhere under the direct personal supervision of the coach" (Point of Emphasis, 1989). Coaches may still be ejected in the traditional sense that they shall "leave the vicinity of the playing area immediately and [shall be] prohibited from further contact, direct or indirect, with the team during the remainder of the game" (3-3-2). Sidebar: NFHS basketball, of all sports, is the one that makes a distinction between a disqualified player and an ejected coach. In high school basketball, a player is DQ'd to the bench, but a coach is ejected out of the visual confines of the playing area. Several years ago, Ump-Attire, with cooperation and permission from what was then known as Professional Baseball Umpires Corp, or PBUC (and is now known as Minor League Baseball Umpire Development, or MiLBUD), published the 10 Standards for Removal from the Game, or essentially a list of what conduct subjects its exhibitor to expulsion from a professional baseball game. » Use of profanity specifically directed at an umpire. Wally Backman provides an example. » Vulgar personal insults directed at an umpire. Earl Weaver and Bill Haller illustrate the point. » Physical Contact with an umpire. Ryan Theroit's bump of Mike Muchlinski violates this standard. » Refusal to stop arguing after warning. Charlie Manuel spent too long arguing with Greg Gibson. » Leaving one's position to argue balls/strikes. Ryan Vogelsong's bee-line toward Phil Cuzzi was problematic. » Referencing a video replay contradicting a call. Jack Hannahan tells Mike DiMuro he saw a replay. » Use of histrionic gestures. Yorvit Torrealba goes crazy after Tim McClelland's safe call. » Throwing equipment from the dugout. Gratuitous clip of already-run Milton Bradley throwing balls. » Actions intended to ridicule. Koo Dae-Sung draws a line in the dirt, in contravention of standards. » Throwing equipment in disgust. Lou Piniella throws down with Mark Wegner for an auto-ejection. » Failure to comply with an ump's order. Bryce Harper ignores Marvin Hudson's order to enter the box. » Entering the field to dispute a warning. John Gibbons argues CB Bucknor's warnings and is tossed. » Arguing after a Replay Review. John Farrell is tossed by Bob Davidson for arguing a replay result.